Designed by Studio Hanson Roberts, the new exhibit to open in May of this year, features green technologies and themed design. The penguins' new home will be outdoor, and features 30' of underwater viewing. The commendable plan for the exhibit includes heating/cooling the exhibit pool through geothermal wells, and water filtration through a combination of traditional filters and Living Machine-type natural filtration. The water volume will be supplemented as needed with rainwater collected from back of house roofs. The Next Zoo Design Revolution? Landscape immersion, which is a type of design intended to "immerse" the visitor in the same natural habitat as the animal, effectively began with the Woodland Park Zoo's gorilla exhibit. Created by zoo design godfathers Grant Jones and Jon Coe as a collaboration with Woodland Park then-director David Hancocks and biologist Dennis Paulson, they coined the term landscape immersion, and thus began the philosophical shift from a homocentric view of zoos to a biocentric view. We now spend massive amounts of resources re-creating "natural" places and cultural phenomena, in an effort to connect people to the earth; to inspire respect of natural places. Back in 1978, this style of design was fresh, new, innovative, revolutionary; nearly thirty years later, the style has become so a part of zoo culture that any exhibit not designed in this manner is questioned for its validity and chances of success. However, should landscape immersion continue to be our design standard? How do we push to the next step beyond landscape immersion? True and successful landscape immersion requires designers to experience a habitat first-hand before beginning to design a re-creation of it. They research the essence of the habitat, the ecosystem structure within the habitat, and the natural ebbs and flows the habitat would undergo. The animal is an integral part of the ecosystem, not just the centerpiece of a painted scene. The visitor is whisked away to another world, drastically different from the asphalt sidewalks and ice cream shops of the zoo midway. Today's landscape immersion is, too often, not this. Today's landscape immersion usually means planting the visitor space with the same plants as seen in the animal exhibit, and using props from a culture as shade structures, means to hide back-of-house buildings, and educational interpretives. Moreover, today's visitor to a modern zoo no longer has their breath taken away by a landscape immersion exhibit; they simply expect to be immersed in an animal's habitat. The magic of landscape immersion is gone. Along with that, the opportunity to educate and inspire is waning, because, as Coe has said himself, "Only the emotional side, in the end, has the power to generate changes in behavior" (Powell, 1997). If the "oh my" moment is gone, does education stand a chance? Landscape immersion does not generate longer experiences, as commonly believed. This can easily be shown true by simply observing visitor behavior at exhibits. After studying visitor length-of-stay time at viewing areas, little to no difference can be observed between the old, concrete moated tiger exhibit at Philadelphia Zoo and the landscape and cultural immersion tiger exhibit at Disney's Animal Kingdom. The average maximum stay time of 90 seconds has been consistently shown through observations at other exhibits as well, including the gorilla exhibit and bongo exhibit at Cincinnati Zoo, and the polar bear exhibits at Detroit Zoo and Louisville Zoo. Despite renovations and millions of dollars spent on landscape, rockwork, and interpretives, the most we can expect of our visitors is a minute and a half. Is this time shorter now than at immersion exhibits in the early 1980's? What can we do now to increase this time? Or, what can we do to get the most impact for our minute and a half? One of the biggest complaints against landscape immersion is the difficulty, generally, in spotting and clearly seeing the animals. Therefore, proximity to animals should be a chief concern in exhibit design. Visitors want to experience something special. They want to do something no one else gets to do; something they have never done. Most importantly, in doing these things, visitors feel connected to the animals. Creating the connection should be of the utmost concern for designers and zoos. Another component lacking in modern zoo design (not just landscape immersion specifically) is the integration of behavioral enrichment into the basic design process. Too often behavioral enrichment is an aspect of the exhibit that is not addressed by zoos to the architectural designer, even if the behavioral enrichment program is being developed concurrently. Most zoos still see the enrichment program as a separate aspect of the new exhibit to be implemented by the keepers after the exhibit is opened. Most architectural designers are ignorant to the importance of behavioral enrichment as a means not only to increase the health and welfare of the animal, but also in creating an active exhibit with active animals, which translates into longer stay times. Thus, enrichment generally is not addressed as an aspect of design, and ultimately we see beautiful new landscape immersion exhibits with large orange boomer balls and blue plastic barrels. Can these be considered cultural props? Recently, behavioral enrichment has been integrated beautifully into primate exhibits, but what about ungulates and big cats? Connection creation and enrichment are the two most important issues that we must address in order to move beyond landscape immersion. The complexity of stepping beyond landscape immersion may seem a daunting task. However, the essence of the next successful step will be in creating "novelty"-something new or unexpected. Novelty to visitors, both within every new exhibit they encounter, as well as within the same exhibit upon repeat visits. We must create novelty to animals, both in new enrichment devices and methods, as well as within their own habitats. We need to make adaptable habitats that can be changed on a daily, weekly, monthly or seasonal basis. We need to make experiences for the visitor and animal that they can share, becoming intuitively novel, since every person or animal will react slightly different in new situations. Thus, our new exhibits will stay new, increasing visitor repeat attendance, and discouraging cookie cutter exhibit design. But how do we begin to do this? In addressing the issues of connection creation and incorporation of enrichment into design, the first and most critical step will be to develop stronger relationships between architectural designers and zoo staff. Designers need to be educated by the keepers on animals' behaviors, both in the wild and in captivity, as well as on methods of behavioral enrichment. Designers should spend a day or two working side-by-side with the keepers as "keepers for a day." This will help designers to not only understand the needs of the keepers in their daily work routines, but also to help create bonds between designers and the animals whose homes they are creating. The zoo staff has a passion for animals that most architectural designers are lacking. This passion needs to be shared and experienced by the designers. In "novelty-based" design, zoos and designers need to work together to develop new methods of enrichment and test them before integrating them into design. Design schedules and budgets should include a phase for enrichment development and testing, wherein the designers work with the keepers to create prototypes to be tested with the animals. If the zoo is designing exhibits for animals they currently do not have in collection, partnerships should be developed to test enrichment devices at other zoos with those animals. These findings should be recorded scientifically and published for the entire zoo community to share. If the zoo uses training as enrichment, the designers need to experience training sessions and clearly understand the need and utility of the training. Keepers and designers should be discussing how all of these methods can be displayed on exhibit. Specific enrichment goals need to be addressed at design kick-off meetings, making numerical goals for incorporating enrichment devices and creating new methods. Enrichment must be seen as a philosophical aspect of design, incorporated into the master planning process, because if animals are active and happy, visitors will become more engaged. Enrichment must be planned not only for the opening day of the exhibit, but for the future of the exhibit as well. Animals become acclimated to enrichment devices and stop using them. We must plan for this, developing phasing plans for enrichment, and flexibility of the exhibit design for novelty of the environment. Most importantly, after the construction is complete, studies must be conducted to determine the successes and failures of enrichment techniques. These results should be shared with the zoo community, and especially, the designers. Secondly, the "novelty-based" design process must become "connection-centered," not visitor-centered or animal-centered. Connections are created both by proximity and by experience. Landscape immersion began to explore this idea by attempting to have visitors and animals in the same habitat, thus experiencing the same things. However, in landscape immersion, we don't experience the same things at all. As visitors, we have a choice to move into a different area, to eat ice cream or hot dogs, to sit and watch the gorillas or to go see the penguins. We don't swim in the same water as the polar bears and we don't get to swing around on ropes like orangutans. What if we started creating these shared experiences? Can we make environments for animals and visitors that are truly similar? What if the actions of a visitor change the environment for the animal? What if the actions of an animal change the environment for the visitor? No longer would we be bound by the idea that the habitat must look like the animals' wild habitat. We could make it look like any thing, any place, any time, as long as the visitor and animal are engaged and ultimately, connected. We have already seen a movement starting to push beyond landscape immersion, and, in some instances, toward "novelty-based" design. Several new exhibits, including the St. Louis Zoo ‘Penguin & Puffin Coast' exhibit and the San Francisco Zoo's ‘Lipman Family Lemur Forest', utilize natural habitat but also incorporate distinctly non-immersive elements, and are exceedingly successful. These exhibits focus on getting the visitor close to the animals (connection-centered) and being surrounded by active animals (behavioral understanding and enrichment incorporation). This experience, which will be different and therefore novel upon each visit, makes these exhibits extremely emotional and therefore memorable to visitors, and begins to create a connection. These exhibits are a step in the right direction toward "novelty-based" design. Using this type of design, we can move to the next incremental step in the evolution of landscape immersion, keeping the "oh my!" moment, and continuing to educate and inspire our zoo visitors. Over time, zoos' physical forms have been a direct reflection of our society's values and understanding of science. It is important to understand where we've been in order to move forward, and its is also important for visitors to the older zoos to understand why certain buildings and exhibits are the way they are (as we know, zoos usually do not have an abundance of money, and struggle to keep their physical state up with the trends). Zoos, in the form we know them now, have been in existence since the mid-18th century. Prior to this, private collections existed throughout the world as far back, it is believed, to Mesopotamian times. Romans kept animals, of course, for sport, but would display the animals in a zoo-like manner, prior to their being released to their deaths in the Coliseum. But we'll focus on the mid-19th century forward. This was the Age of Enlightenment and the Romantic Age, where beauty was of the upmost value and our understanding of the natural world was blossoming into a science. Hard science in this time was all about classification and comparison. Linneaus and Darwin were the scientific stars. The earliest official zoos began during this period, with the London Zoo in 1828 and Philadelphia Zoo in 1874. The early zoos were based on the mission of science for science's sake, but also were places for socializing. As such, a balance between beauty and classification was struck. The zoos of this time were laid out by taxonomic families, and the term "House" came into being, as in Cat House, Bird House, etc. The architectural style was over the top beautiful. Highly ornate bird cages and buildings themed in the most dramatic fashion were everywhere. But, cages were small, animals were short lived, and people enjoyed the animals as beautiful objects rather than living beings. During this time, the world was experiencing several wars. The study of nature became much less important, but Romanticism still existed. Science progressed into problem solving, and medical advances were abundant. Vaccinations became prevalent and the idea of killing germs to increase health and extend life expectancy came into being. During this time, zoos held a similar value as art galleries, and the exhibits became mini-paintings and sculptures. 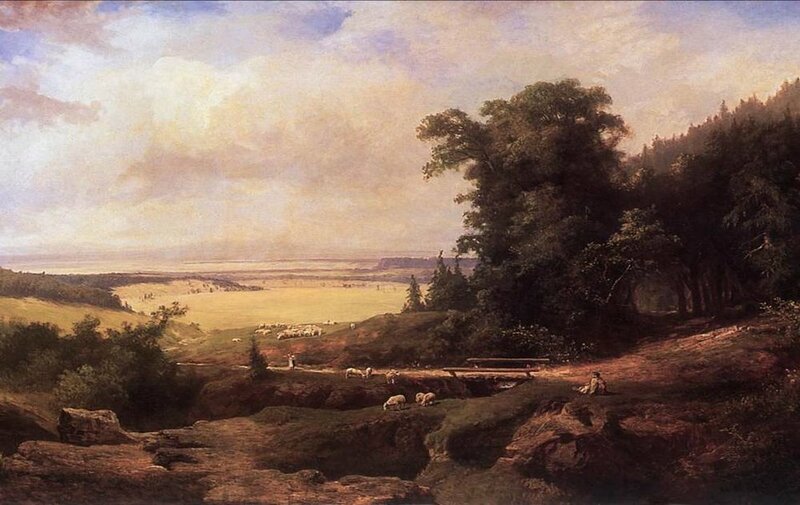 In the Romantic movement, a proper landscape exists with a foreground, mid-ground, and background. 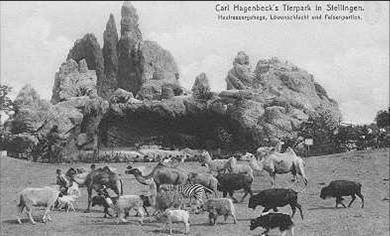 Carl Hagenbeck became the first-ever to apply this theory to zoo design resulting in the birth of the barless (or 'moated') exhibit. His motivation was more about creating a living Romantic landscape, like the famous painters of his time, than to recreate nature for moral sensitivities. This style started to catch on in zoos, but generally became popular much later. At the same time, the modernist movement was catching fire. Modernism requires that form follow function. This belief along with the advances in medicine and desire for sterilization, created zoo exhibits that were easily hosed down and cleaned regularly. This meant concrete everywhere. Additionally, the Modernist Art scene infiltrated zoo design, and the hard, simple lines for which modernist style is famous, reigned supreme. The result was exhibits that look more like sculpture than habitat. With both the Romanticism and Modernist styles abounding in this time period, zoo design was more about creating an art gallery than a responsible home for animals. Interestingly, due to the increased attention to health, captive animals' life expectancies did increase almost to today's levels. The only thing missing was attention to the animals' mental health. Since the mid-20th century, our society has developed a strong sense of environmental awareness and human rights ethics, which eventually gave way to animal rights as well. In 1950, Hediger wrote "Wild Animals in Captivity" which opened people's eyes to the idea of husbandry practices and exhibit design based on an animal's natural history. What a novel approach! With the advances in healthcare (which overlaps into this era), animals in captivity began to be treated for physical as well as mental health. During the 1970s, a group of folks at the Woodland Park Zoo (including two young designers from Jones and Jones Architects) decided to resurrect Hagenbeck's ideas from long ago--and to advance them. Instead of creating a living painting, they wanted to put the visitor into the habitat...Immerse them in the painting. And, instead of creating a visually exciting statement only, they decided to re-create the habitat in the which the animal was naturally seen. All of these things were incorporated into the gorilla exhibit at Woodland Park Zoo, and, thus, landscape immersion was born. 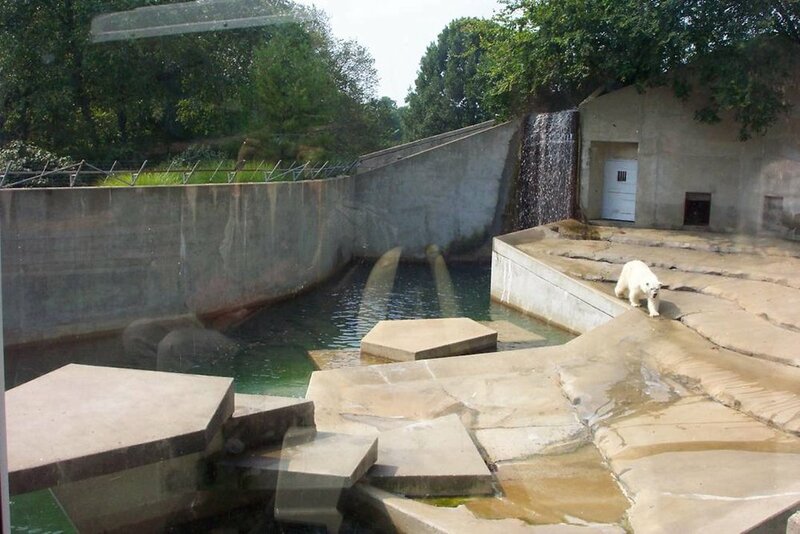 Since then, the idea of landscape immersion has caught on like wildfire, and today, is the standard of responsible zoo design. Understanding the past, I have to wonder where we are headed next...A topic for future discussion.